TACLOBAN CITY-Military and police authorities in the region are preparing for the deployment of additional personnel to Samar in compliance to a directive issued by Malacañang to address the existence of ‘lawlessness violence’ in the said area. And amid fear of possible rights violations, officials of both security agencies assured the people of Samar, in particular, that their personnel would not do any acts that could result to violation of their rights. Senior Supt. Arnel Arcenas, police assistant regional director, said that they are putting a high premium on human rights which will guide them as they carry out their duties. “Actually, yung human rights (will)serve as our guide in the implementation and enforcement of our laws. We don’t oppose in (respecting) human rights,” Arcenas said during a press conference on Monday (Nov.26). And in a press statement, Major General Raul Farnacio, commanding general of the 8th Infantry Division based in Catbalogan City, also made a similar remark. “To the general public, rest assured that your Army will strictly adhere to the rules and procedures set forth by higher headquarters in the conduct of internal security operations in Eastern Visayas,” he said. Farnacio said that the additional troops is needed to ensure deterrence of the armed groups involving members of New People’s Army and private armed men. “Malaki ang problema sa first district of Samar, dahil sa hindi ma contain yung PAGs at may mga intelligence reports kami na madami ang arrivals of PAGs ngayon sa Samar galing sa Misamis,’the commanding general of the 8th ID said. To recall, President Rodrigo Duterte issued Memorandum Order 32 through Executive Secretary Salvador Medialdea on Nov.22 calling for deployment of soldiers and police in Samar as well as Negros Occidental, Negros Oriental and the Bicol Region for the existence of lawlessness violence in these areas. Arcenas said that they have not yet received a clear directive as to where they would get the additional police force to be deployed in Samar. “It could be from the national headquarter or from the Regional Mobile Force,” he said, adding that at least 100 policemen could be deployed in Samar. He also said that there could be a basis of the President’s declaration on the existence of lawlessness violence in Samar. Arcenas said that these information were validated and reported not just by PNP or Army but by other security agencies of the government like the (National Intelligence Coordinating Agency (Nica). 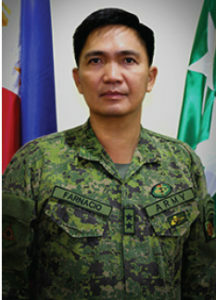 Captain Francis Agno, spokesperson of the 8th ID, said that as part of the augmentation, two Army battalions of the division earlier deployed to Mindanao would return to the region. These are the 34th IB and the 19th IB which were assigned to Midsayap and Arakan, both in North Cotabato to help fight against terror groups. But Agno said that they have no schedule on the return of the two Army battalions to the region. But this early, human rights groups have expressed their fears that the additional forces in Samar, where there are still members of the New People’s Army and private armed groups operating, could result to human rights abuses and fear among the people. The Promotion of Church People’s Response (PCPR), a Church-based organization, said that the move could only ‘sow fear’ among the people. “The militaristic approach has proven to be a deadly approach and has never delivered genuine welfare for the people. It could sow fear and reap more unrest,” Rev. Irma Balaba of said group said in a statement. “It will only lead to more community encampments, extrajudicial killings, bombings, red-tagging, harassments and other human rights violations. President Duterte’s declaration of state of lawlessness in Eastern Visayas is of no objective basis, but is only driven by his greed for power and his armed troops thirst for blood,” the group said.